In squally rain and 30 to 40 knot winds nine club members (average age 70) left Cape Point on the 75km Hoerikwaggo Trail over Table Mountain to Cape Town. After the 81/2 hour introduction to all that the Cape of Good Hope could throw at us we arrived in Smitswinkel Bay and the luxury of ensuite tents. By contrast, next day, we hiked in excellent weather past Kleinplaas Dam to Slangkop where, on ‘Heritage Day’, we were able to savour excellent food and live music at the local beer garden. The brilliant weather continued on the third day as we climbed Chapman’s Peak and then a series of steep hills and valleys bringing us, after a deviation for a welcome beer, to Silver Mine Camp. Once again Day 4 involved more steep climbing, up and down, with rocky crags and brilliant views before entering the camp at Orange Kloof. On the final day the weather turned once more so that in misty, wet and cold conditions we climbed the back of Table Mountain, over rocks and up steel ladders, before a welcome ride down Table Mountain to cap our amazing and enjoyable hike. 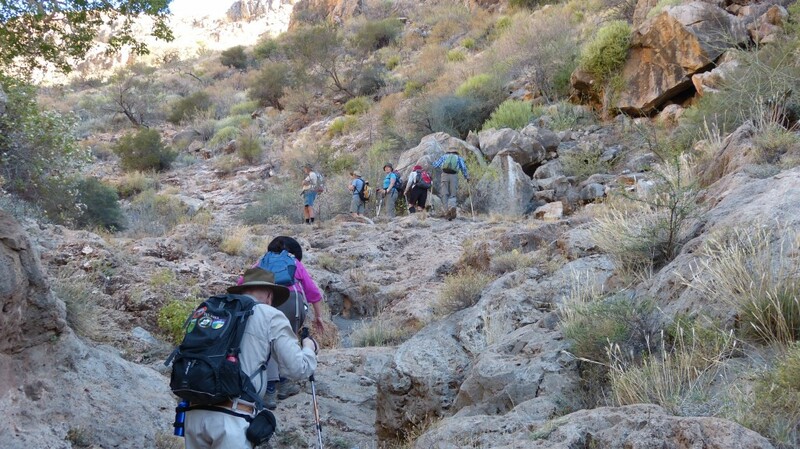 Nine more club members then joined us to explore the Garden Route and there we hiked the Outeniqua and Swartberg Passes. We were in awe as we saw the engineering and massive dry stone walling that were part of the construction of these roads. The top class guesthouses were luxurious and we had two brilliant guides. Back in Cape Town the party grew to 24 for a 23-day safari to Victoria Falls. The first stop in Cedarberg enabled us to view the Wolfberg Craggs and hike the trail to the Maltese Cross (and for some, across a boggy alpine landscape in the area of Sneeuberg Peak). 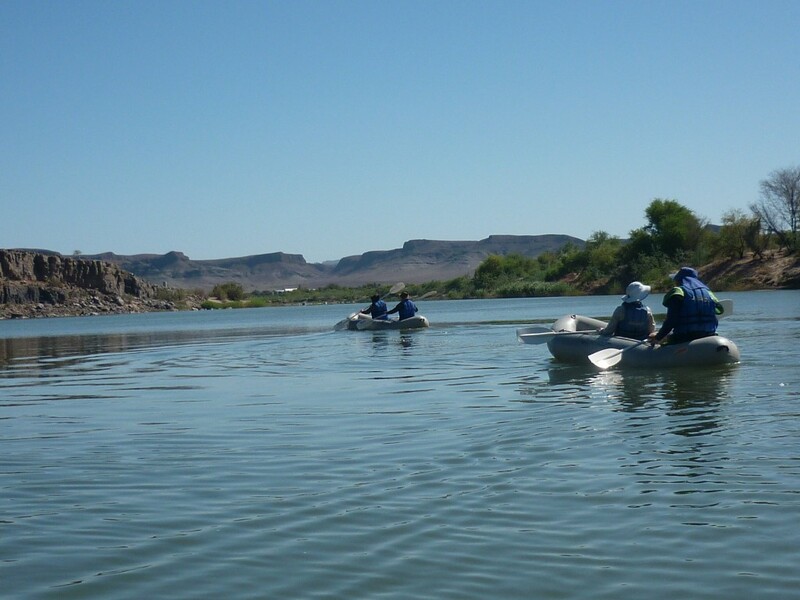 Rafting on the Orange River gave us a break from hiking before entering Namibia and arriving at Fish River Canyon. More brilliant hiking in the Naukluft area where we were now seeing many more zebra, kudu, spring box and different birds. 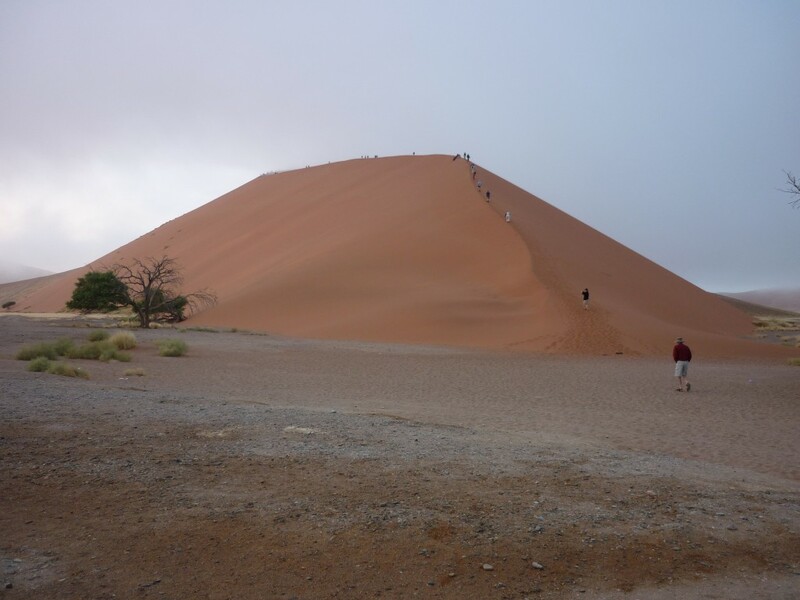 Suddenly the terrain changed and we were travelling through desert visiting Sesriem Canyon and climbing the 300 m sand dunes of Sossusvlei. 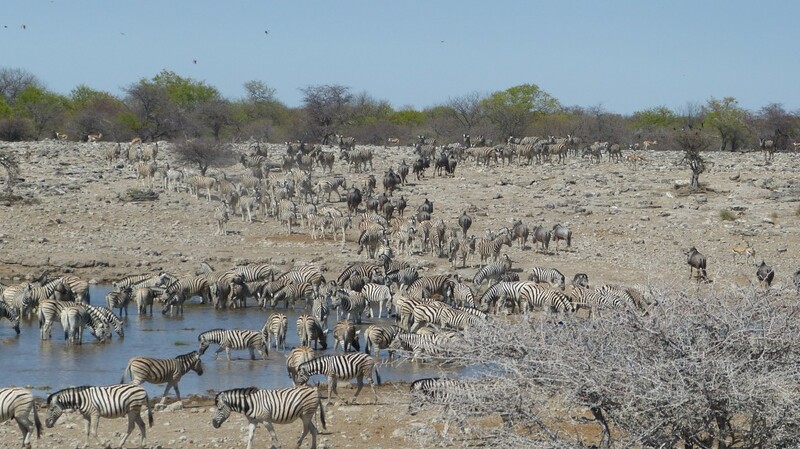 A quiet day in Swakopmund preceded serious game viewing in Etosha where we were fortunate to see a huge range, and number, of animals. Zebra, elephants and giraffes became commonplace but the sight of four lions stalking and chasing two warthogs brought everyone out of their seats. 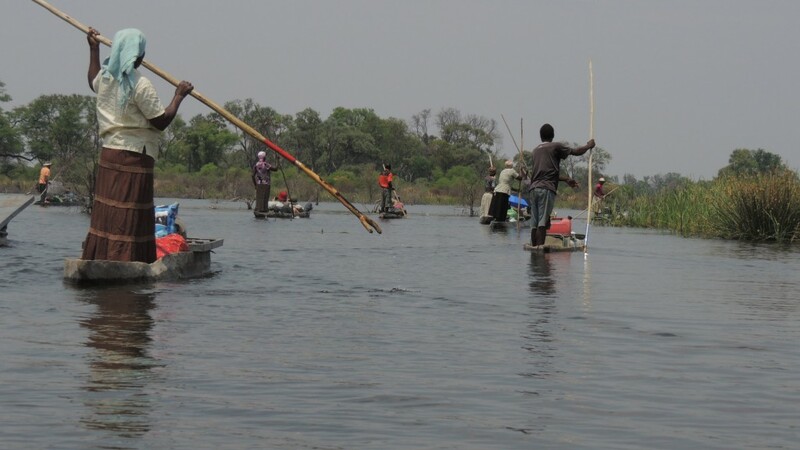 Using mokoros, traditional dugout canoes, we then spent 3 days with local villagers in Okavango Delta. 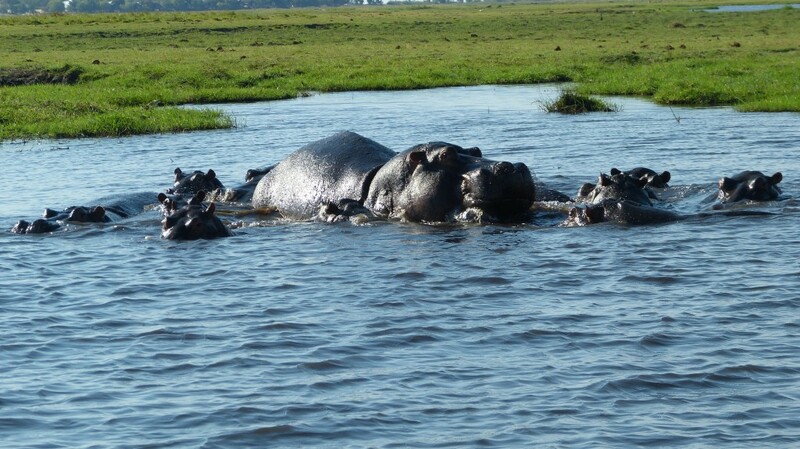 We were treated to our first hippos and experienced creeping through the bush to get up close (very close) to zebra, elephants and buffaloes. 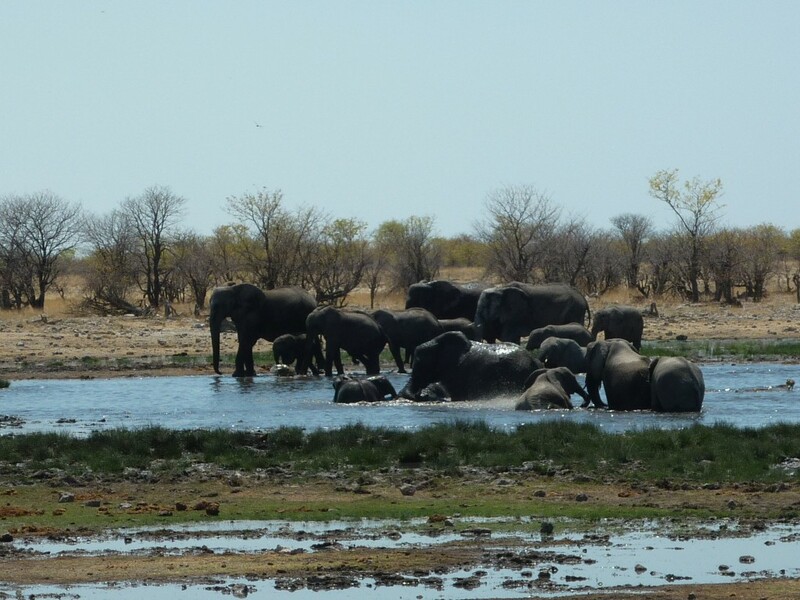 After a night in Chobe, where on a sunset cruise we were able to watch elephants playing in the water, we came to Livingstone and the Victoria Falls. This brought us to the end of the safari and we spent two days enjoying different activities. 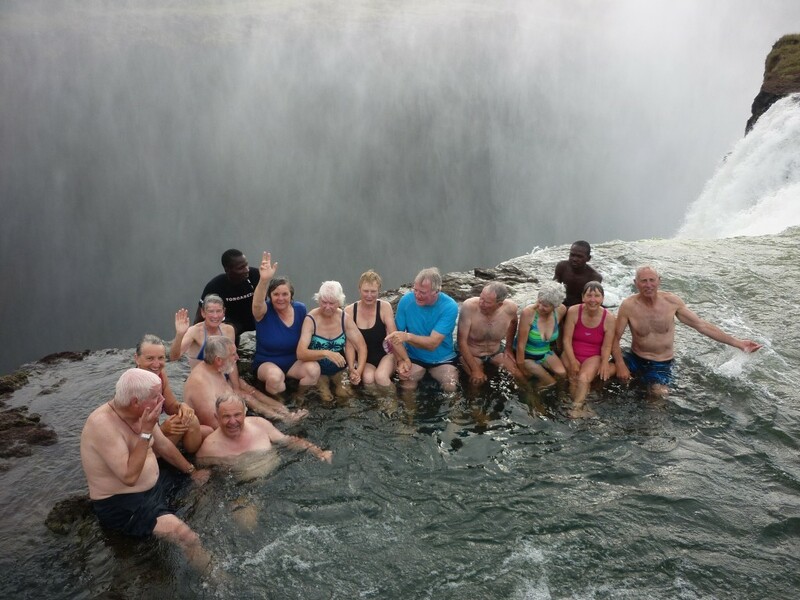 The highlights here being another sunset cruise, this time on the Zambezi, riding elephants, walking with lions and cheetahs, viewing the Falls (both from the ground and from a helicopter) and the ultimate experience of swimming through the Devil’s Pool and peering over the lip of the falls at the 100m drop. Amazing memories. After returning to Johannesburg some left for home and 14 of us drove down to Ladysmith and spent two days walking in and exploring the Battlefields of the area. Then we had a Zulu experience and were amazed by the energetic dancing before arriving at Imfolozi Wildlife Park. Here we split into two groups of seven, each escorted by two guides with elephant guns, to carry packs and camp in the wilderness. Having already seen many animals, and realising how successfully they camouflaged themselves walking was quiet, slow and careful with eyes swivelling in all directions. Even so one of the groups had a frightening experience when three Rhinos charged them. Adrenalin charged they scattered and hid safely, but scratched, behind trees. The trip ended with four days spent hiking in the Drakensberg Mountains. 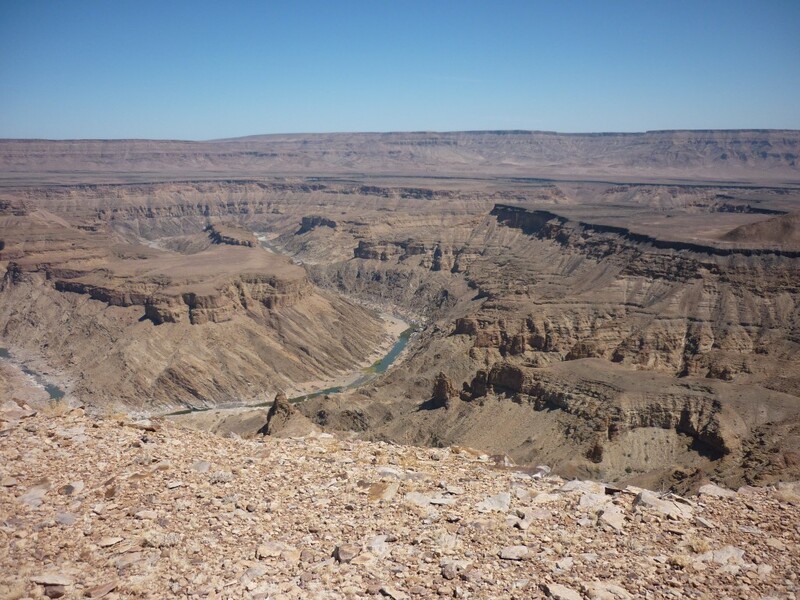 The views at Giants Castle were once more spectacular but did not compare to the experience of walking, and wading, up Thukela Gorge in Royal Natal Park. We ended our 56 days of variety and unforgettable experiences by exploring Johannesburg and Soweto. A slide show with many additional pictures can be found here.